Morphett’s Engine House, erected in 1858, and Morphett’s Winding Engine (background), erected in 1861, are two of the most impressive engine houses at Burra, South Australia (Edward Higginbotham, 2006). 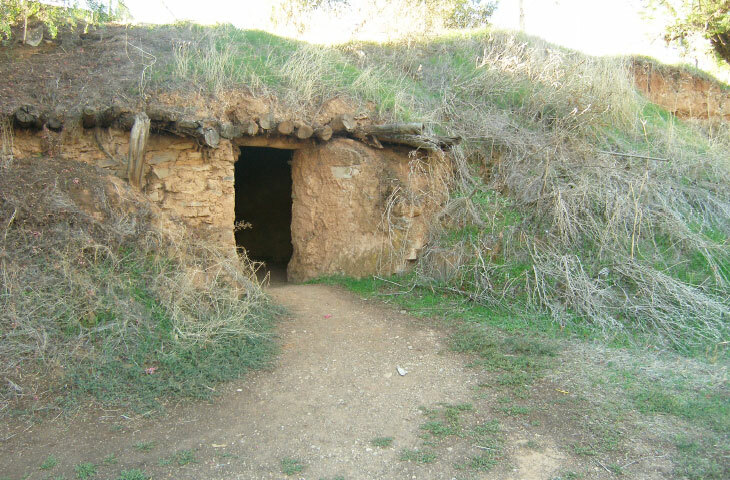 Copper was discovered by shepherds on Burra Burra Creek (often shortened to Burra) in 1845. Two parties jointly purchased the Special Survey of 20,000 acres for the price of £20,000 charged by the government. The land was divided into two blocks and, as agreed between the parties, lots were cast for each portion. The Princess Royal Mining Company won the southern half, while the South Australian Mining Association (SAMA), formed earlier in 1845, was left with the northern block. The southern block proved to be shallow unproductive deposits of copper, resulting in the closure of the Princess Royal Mining Company in 1851. The northern block, the “Monster Mine”, made South Australia the third largest producer of copper in the World in 1851. Up to that date Burra gave up 80,000 tons of ore, valued at £800,000, with peak production of 23,000 tons in 1851. The company paid up to 15 dividends of 200% in its first five years, thus making some of the shareholders wealthy men. The secretary of the Association and later managing director was Henry Ayers, later premier of South Australia. Like other early mines in South Australia, Burra predominantly employed Cornish miners and specialists, with up to 1,000 working at its peak. Henry Roach, from the Tresavean Mine, Redruth, was superintendent from 1847 until he retired in 1868 and was responsible for the erection of all the Cornish engines at the mine. 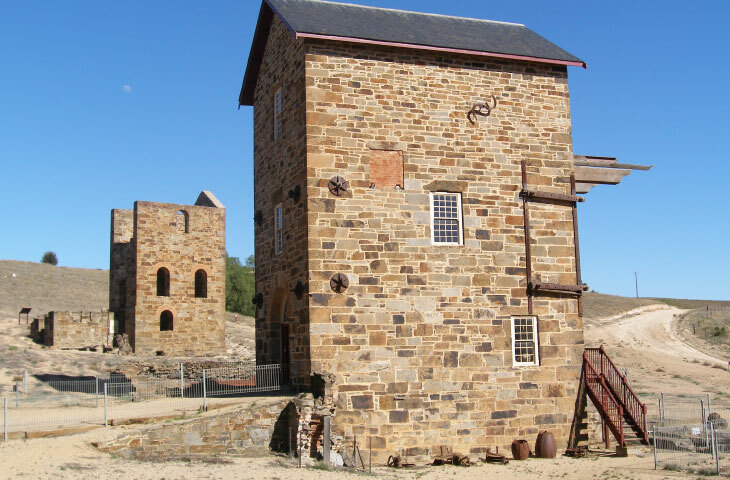 Six Cornish engines were erected for draining the mines by 1861 and another three smaller examples for crushing and raising ore.
Like Kapunda, the ores were smelted in Swansea until 1849, when Burra opened its own smelting works. Ore production declined after 1861, losses being made in 1864, resulting in mine closure in 1867. An ore dressing and concentrating plant was erected in 1869 and an open cut mine commenced in 1870, but finally closed in 1877. Between 1845 and 1877 the mine produced a total of 50,000 tons of copper. The mine was reworked as an open cut from 1971-1981. The original mining settlement, the company township of Kooringa, was laid out in 1846. The company built cottages, leasing them to the mine workers and their families, but did not sell any allotments until the 1870s. To provide freehold land, the government laid out a second township, named Redruth, outside the Special Survey, selling allotments in 1849. Land directly to the north of the Special Survey was purchased by the Scottish Australian Investment Company in 1846 for the high price of £5,500, hoping to find an extension of the Burra orebody at its Bon Accord Mine. Failing to find any payable ore, the company subdivided part of its land as the township of Aberdeen in 1849. An extension of the township on company land, New Aberdeen, was subdivided and sold in 1872, two years after the arrival of the railway from Adelaide. Another township, called Hampton, was laid out and sold in 1857. Of all the townships at Burra, the Welsh settlement of Llwchwr is the most unusual on land bought in 1855 to house the Welsh smeltermen. 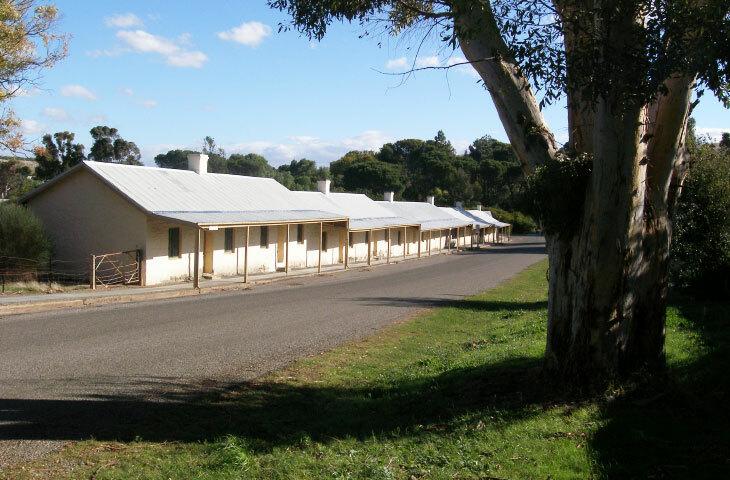 A row of miners’ cottages, Paxton Square, Burra, South Australia (Edward Higginbotham, 2006). This unprepossessing stone building on Paxton Square, Burra, is claimed to be the first Bible Christian Chapel opened in Australia in 1850. It is a good example of the non-conforming faith brought to Australia by the Cornish miners (Edward Higginbotham, 2006). 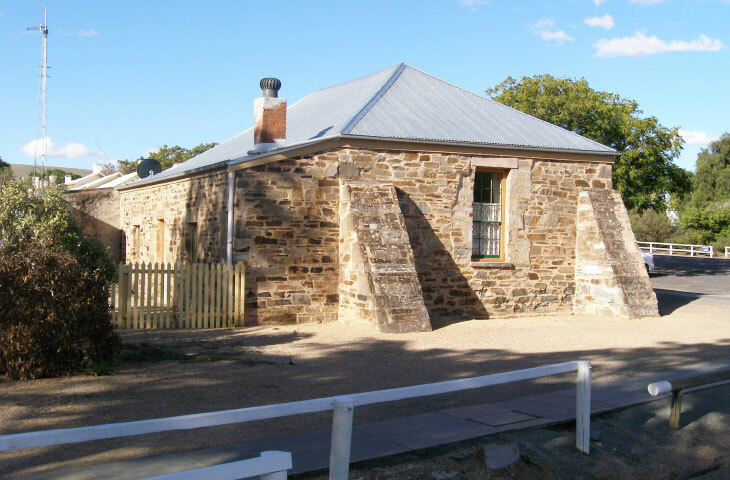 Such was the demand for accommodation at Burra in its heyday that miners dug into the banks of the watercourses to provide their families with accommodation (Edward Higginbotham, 2006).